Growing up, I was a Girl Scout for many years. I was always a shy girl, making cookie season difficult for me - I hated going door-to-door to sell cookies! Needless to say, I never won any top seller awards! Since I moved out after graduating high school, I rarely get girl scout cookies any more. I don't have any friends with kids (or at least, kids old enough to be in Girl Scouts! ), and while there are occasionally lists at work to buy off of, I'm in a different unit or hospital every month, making it difficult to pick them up if I were to order. Cream together butter and sugar in a large bowl. Mix in flour, baking powder and salt at a low speed, next, the vanilla and milk, adding in the milk only as needed to make the dough come together without being sticky (you may not need any at all). The dough should come together into a soft, pliable ball. Add in a bit of extra flour if your dough seems sticky. Bake cookies for 10-12 minutes, until bottoms are very lightly golden brown around the edges. Cool for a few minutes on the baking sheet, to allow them to firm up slightly, then transfer to a wire rack to cool completely. Spread coconut evenly on a rimmed baking sheet and toast 20 minutes, stirring every 5 minutes, until coconut is golden. Watch carefully, especially near the end of toasting time; the coconut toasts very quickly once it begins to become golden. Using the spatula or a small offset spatula, spread topping on cooled cookies, using about 2-3 teaspoons per cookie. 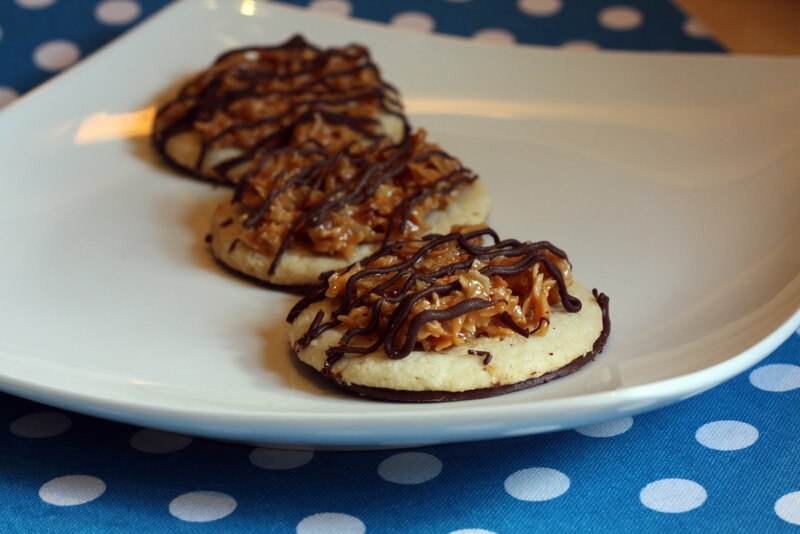 Reheat caramel for a few seconds in the microwave if it begins to firm up, to make it soft and spreadable once again. While topping sets up, melt chocolate in a small bowl. Heat on high in the microwave in 30 second intervals, stirring thoroughly to prevent scorching. Dip the base of each cookie into the chocolate and place on a clean piece of parchment paper. Transfer all remaining chocolate into a piping bag or a ziplock bag with the corner snipped off and drizzle finished cookies with chocolate.